After three months of exploring the most northwestern state of the US, Alaska, and the famous city of northern California, San Francisco, I was about to start my trip to Southeast Asia. At that point, the only Asian country I had visited so far was China. Of course, incomparable. I could not go straight from San Francisco to Manila, Philippines. In Taipei, Taiwan, I had a layover. It was the longest flight of my life. 13 hours or 780 minutes, 6,462.26 miles or 10,400 km, crossing the international dateline, skipping one day. My legs were hurting. That was just the first part of my trip. Spending a couple of hours at the Hello Kitty decorated Taiwanese Airport, having the smallest and at the same time most expensive cappuccino in my life, charging my phone, connecting to the world. A rather relaxed layover. Next flight. American neighbor with Filipino roots. We started talking. He consulted me where to go and which touristic places I should avoid. His advice was very helpful. He actually gave me a first idea of the country. Furthermore, he gave me a little heads-up of all the potential dangers. I should be very careful. People are less interested in a good long-term relationship with tourists, but more in short ways of ‘making’ quick money. I will find out. Even though I tried to inform myself before I actually went to the Philippines, I just could not. While I was in Alaska, I could not think of San Francisco. I only took care of a place to stay. When I was in San Francisco, it was the same. I could not think of the Philippines. I start planning my trip when I am physically at my destination. Some days later, I will mentally arrive there and the actual planning can begin. That seems to be my way of travelling. Anyhow. After a 24 hour long trip, I finally arrived. My first impression: Hot, hotter, Manila! The humidity is almost 100 %. The air is literally standing, the sweat is pouring out of every single pore of the body. Welcome to Tropical Island! My second impression: The city is packed. Huge crowd of people everywhere. No wonder. Metro Manila, the National Capital Region, is home for around 12 million people. After the last typhoon in 2012 that killed about 6.000 people and destroyed a multiple number of homes, more and more Filipinos are moving to the capital hoping for better job opportunities. (FYI: Due to the Philippines’ location on the so-called ‘Ring of Fire’ close to the equator, natural catastrophes like earthquakes and typhoons are very likely to happen.) The country itself is home to almost 100 million people and has one of the fastest growing population in Asia. Driving from the airport to my place was already proof enough. The traffic was insane. The distance from the airport to my place was about 7 km. Not that far away, you would think. The only problem: Thousands of cars occupied the road. There was almost no moving forward, well, no moving at all. Instead, more and more cars and scooters tried to squeeze in. It was insane. No traffic rules, pure anarchy. Just find your own way! At the end, it took us almost two hours to get to the apartment in Makati. Two things I learned during my very first hours in the Philippines: First, only take a cab with very good air condition. It can save your life! Second, never be in a hurry; always have enough time. You will need it for sure! On our drive, I could already observe some of the sad characteristics of a developing country: Extreme poverty and pollution everywhere. Self-built houses out of every kind of material people find in the streets, obviously unstable, and yet people are living in them. After travelling in all different kind of poor countries, I should be used to this kind of scenery. But I am not. It is still devastating to see the poor living conditions; the complete opposite of the fancy life of the Western societies. How can one world with one mankind live in such extreme inequalities? How could this happen? Well, I stop that thought right there. I do not want to start a philosophical debate at that point. The country is situated in the western Pacific Ocean and consists of more than 7,000 islands (!!!). Even though natural catastrophes happen quite frequently, the Philippines is also home to some of the world’s greatest biodiversity. Being part of the Spanish colonization in the 16th century, there is still some influence visible on the Filipino culture nowadays. For example, did you know that the Philippines is a catholic country? Well, I did not know that… There are Roman Catholic churches everywhere. That is also the reason why many Filipinos still have Spanish names. In Manila, you can visit ‘Intramuros’ and the ‘Rizal Park’. The former was the centerpiece of Spanish Manila. The latter is a park named after the national hero José Rizal who is mainly famous for his writing. The Spanish colonial government executed him for the crime of rebellion after an anti-colonial revolution broke out which was partly inspired by his writings. Besides of Spain, another country still has some impact on the Philippines is, of course, the United States, which retained sovereignty over the islands until 1945. Gaining independence after World War II, English retained the second official language after Filipino. Kamusta ka – How are you? Pretty much everyone who has been to the Philippines told me to get out of Manila as fast as possible. They were right. There was not much to see anyway. It was just another packed, chaotic, dirty and hot city. I stayed only for the first two days there. At least a little time for some acclimation and for planning my trip. First stop at Malapascua, part of Cebu Island. Every Filipino suggested going there. It would not be as touristic as other places in the Philippines. Furthermore, it was the place to be for scuba diving. Malapascua is a little island in the very north of Cebu Island. It takes you a five-hour bus ride to Maya, then a ferry to the island itself. Currently there are around 3,000 inhabitants living on the 2.5 by 1 kilometer small island. The island basically lives from tourism, mainly water activities like scuba diving, snorkeling and Island hopping. It is famous for the thresher sharks that can only be seen in the Indian and Pacific Oceans. Lucky Malapascua, the thresher sharks regularly visit cleaning stations close to the island. Good for ambitious scuba divers that sometimes only travel to the Philippines to dive with thresher sharks. Nevertheless, Malapascua is still a paradisiac island with crystal clear, turquoise water, white beaches and no matter where you look a stunning scenery. Furthermore, the Island and its surrounding water is famous for its diverse marine life. In sum, Malapascua is the perfect place to become a scuba diver. At least for me. I had my private instructor, Caroe from Germany. She was teaching me all the necessary skills of a future scuba diver (I can only recommend the dive shop ‘Sea Explorers’). I gave her a very hard time to be honest… At that point, I had never ever done any kind of water sports (except for swimming, of course) before. The whole underwater world was new to me. Probably the main reason why I was very scared underwater at the first time. I just could not believe that I could see and breathe down there! The world of the aquatic life opened up to me! It was amazing! Everything was looking different, everything sound different. Just wonderful! Even though I was very scared at the beginning, I overcame my fear and fell in love with Ariel’s world ‘under the sea’. I was observing the colorful beauty of hard and soft corals, seahorses, clownfish (NEMO! ), sea anemones, sea stars, sea urchins, sea snakes, sea cucumber, shrimps and so on. It was wonderful! After studying and practicing for almost four days, I finally accomplished the PADI scuba diving certification in open water (18 meter deep). Since scuba diving makes you addicted very quickly, I even went for the thresher shark dive that qualified me diving in deep water (30 meters). Parrotfish – my new favorite fish in the world! The one and only famous Thresher Shark! Due to another typhoon (Lando/ Koppu) touching the tip of Cebu Island during my week in Malapascua, several dives could not take place. The waves were just too strong! Nevertheless, I had an amazing time there! I was hanging out with the scuba diver community, instructors and students from all over the world, feeling like I have always been a part of this wonderful group of sea explorers. They showed me their best underwater pictures and videos, telling me amazing adventurous underwater stories, warning me how addictive diving would be. I can already feel it! After staying in paradise for a week, it was quite hard to return to the city. I would even say it is the worst you can do in the Philippines. Never ever go to a big city! Try to avoid it! If you have no choice because you arrive too late and you have to stay overnight, leave it to one night. That is more than enough! There are so many beautiful places to see in the Philippines. Remember, 7,000 islands! Do not waste your precious time in paradise in the hell of consumption. I mean the only good thing you can do in the city is spending your time in shopping malls. That is at least what I did… I went to two different kinds, bought the things I needed for the rest of my trip, enjoyed delicious food and at the end of the day a relaxing whole body Thai massage for three bucks (!!!). Now I feel prepared for the next stop. Let’s move on! It only took a 7-hour long ride with a minivan to arrive El Nido on the Northern top of Palawan Island. Every traveler I had met so far admired El Nido. It was beautiful, there was so much to do, so many amazing travelers were there, I should stay at least one week. Ok, if they say so. During the couple of days I spent in El Nido, I joined the Island Hopping tours A and C both of which highly recommended from other travelers. During Tour A you will stop at the paradisiac 7 Commando Beach, visit the Small and the Big Lagoon, explore the white beach of the Secret Lagoon and at the end snorkel at the Simizu Island. Overall, it was the PERFECT DAY! I finally made my way to paradise! Starting at the 7 Commando beach, hanging out in crystal clear, turquoise water, drinking fresh coco milk out of a coconut, enjoying the stunning beauty of the limestone scenery in front of us. The ultimate stop was at the Small Lagoon where I was snorkeling, kayaking, stand up paddling, jumping from the boat, feeling young and free again. Life can be so good! It was wonderful! On the last stop, it was all about snorkeling. Even though I was snorkeling on all our stops, it was very different at Simizu Island. To me it felt like I was flying in the water. I was floating on the surface, but exploring the fascinating variety of the aquatic life underneath me. I was swimming with different schools of fish, following rainbow and clown fish. Of course, I have no idea what kind of fish I saw, but it was a bunch! Now I am interested to learn more about the different types in the South China Sea. While I was flying around in the water, enjoying the beauty of colorful fish and corals, I almost felt like the little mermaid, Ariel 😉 I wish I had gills! Tour A was definitely the right choice! Besides all those amazing activities, we had quite entertaining guides with us that made our time even more pleasant. They worked more as photographers than as guides. All the time, they were taking pictures from us for us and commented on them with ‘I don’t like it, I LOVE IT!’. Sometimes they put us in weird positions to play with perspective and take the most hilarious pictures of us. I was laughing tears! They were so creative! They could easily work as photographers if they ever get bored from guiding tours. They have the talent for it. That is for sure! However, next day, next tour. This time it was Tour C going to the Matinloc Shrine (the Christians are really everywhere! Unbelievable! ), Talisay Beach, the Hidden and the Secret Beach, at the end, snorkeling at Helicopter Island. Again, we had a wonderful time and the beaches were nothing but beautiful. Unfortunately, this time there were many, many tour boats going to those beaches at the same time, which is why it was quite packed. At least we went to the Secret Beach, the one that inspired Alex Garland, the author of the novel ‘The Beach’. To be honest, I could not get the inspiration from that beach in particular. It was nice, but we had already seen more impressing beaches. Our tour guide told us the movie was shot in Thailand even though the inspirational beach was in the Philippines because of the limited flight connections. Bringing all the movie equipment to El Nido would had been too expensive and too complicated. During my stay in El Nido, I did not only discover the tempting beauty of paradise, but also met some amazing people there. We had a wonderful time together! Unfortunately, I could not stay longer. El Nido was just too expensive… which is why I wanted to take the ferry to Coron Island up in the north as soon as possible. Unfortunately, the next ferry was already fully booked. I had to wait for at least two more days! I could not believe it. Well, I could not afford it. I was walking around in El Nido, asking every single agency for a leftover ferry ticket. At the end, I was successful. The agent told me there was still space. No problem, no problem! I had a bad feeling about it anyway. I wanted to give her my number just to make sure she can reach me if something might change. She did not want to have it. The next morning. The agent waiting to pick me up. ‘Sabrina, I am sorry! But the ferry is booked out!’ ‘That’s what I told you yesterday!’ I could not believe it. Together we went to the harbor. She tried to trick me into the ferry, telling them lies about a flight I have to catch in Coron. At the end, they did not care; I could not go on the ferry. I was stressed out! I really wanted to leave El Nido and move on to another Island. I just did not want to wait any longer. Apparently, this was a common problem. A bunch of Filipino could not go on the ferry. Several minivans brought us to another town at the sea where a rather tiny boat was waiting to take us to Coron. Approximately 50 people on a boat of the size for maybe half the number of passengers. However. I was the only foreigner traveling with them. It was quite an interesting experience! I always tell people how I want to travel with locals and not take the easy, more convenient and more expensive way. Like I learned during my stay in the Philippines: You either have the money, or time and legs! It is so true! You can take the easy, convenient and fast way if you have the money, or the long, less convenient, but cheap way if you have the time and the legs. So did I. When I arrived at my guesthouse, it got even better! I had a private bamboo room floating on water for half the prize of my dorm bed in El Nido. The Filipinos taking care of the guesthouse were super duper simpatico! Instantly it was an entirely different feeling there. Less professional, but more authentic. I don’t like it, I LOVE IT! Unfortunately, ‘magic’ always comes with a price. The incredible noisiness during my week there was driving me crazy. The bamboo walls looked good, but let all the noise through. People talking in the guesthouse in the common area, outside in front of my room; crying babies; playing and trampling kids in the very early morning hours; crowing ROOSTERS, ROOSTERS, ROOSTERS all night long; fighting cats; horny cats; whiny puppies closed to starving to death. The Philippines are noisy. If you are looking for a good rest, then you should definitely spend some money on good isolated hotel rooms. FYI. Like usually, the Island Hopping Tours were beautiful and I discovered many new things. I would even consider myself now as a ‘semi-professional snorkeler’. At the Green Lagoon, the destructive effects of the 2013 Typhoon were still visible. The coral reefs are still on their way of recovery; not colorful or healthy looking at all. Approximately 10 percent of the reef is still suffering from the aftereffect… Nevertheless, there are still some nice spots to discover. Every now and then, you can even see fluorescent corals (purple-blueish), and again swim with clown- or parrotfish. This time we could even swim with two sea turtles for a while. That was amazing! On some other spots, you have to be very careful in the shallow water, sometimes covered with hundreds of sea urchins. I got plenty of scratches because of the sharp corals even though I tried to swim as far above of them as possible. Well, scars of an adventurer 😉 Flying on the surface and exploring the beauty of the world underneath you is an unforgettable experience. The dancing reflection of the sunlight underwater is just indescribable! Non scuba diving pictures… but at least some underwater pictures I got from a lovely French couple I met during my stay in Coron. Thank you, Cricri and Jak!!! In Coron is plenty to see. It is not only a scuba diving hotspot, but also famous for its lakes that consist of 70 percent fresh water and 30 percent salt water, a very rare combination. All the sudden, floating will be harder and swimming more tiring, but not less fun at all, of course. You can explore very beautiful rock formations of the limestone cliffs under the water and dive with Barracudas (Don’t worry! They are harmless vegetarians!). After a very long day of exploring and a lot of excitement, you can always rest in the rare saltwater hot spring Maquinit. It is a quite interesting experience to go into a hot spring in a very hot country… Nevertheless, definitely something you should experience while you are there! After traveling from the mainland to Cebu and Palawan Island, I decided to explore the northern part of the Philippines as well. The rice terraces of Banaue claim to be the 8th Natural Wonder of the World. Since it was my first time in a Southeast Asian country, I had not seen any rice terraces before. I definitely had to go there. Like usually, not an easy thing to do. The Philippines is a huge country. You should not underestimate the distances. While the airway is the most convenient way of traveling for sure, it would not take you everywhere either. There was no airplane going from Coron to Banaue, for example. I could only go back to Manila and take a bus from there. Unfortunately, at the beginning of November, the season started and the prices went up very fast. The best and cheapest way to get back to the mainland was by ferry. Next problem: The ferry only runs once a week. You cannot go whenever it suits you best… So I had to wait. Of course, the ferry had a delay. Not a tiny little one… no… only five hours. It took me 19 hours to get to Manila. Apparently, the engine was broken in the middle of our way on the sea. At least they could fix it and continue… Getting from the port to the bus station took another hour due to the insane traffic in Manila during daytime. I got there way too late to catch a bus up north. There was no other way than taking the night bus. Waiting for another 8 hours far away from the city center. Already exhausted and tired. I just caught a cold and felt very weak. Unshowered. Dirty. Another 16-18 hours to go. I guess that is just how it is in the Philippines! How do they like to advertise their country? ‘It’s more fun in the Philippines!’ That definitely gets a whole new meaning after that trip… I guess that is just one of the downsides of traveling… Sometimes it takes a very, very long time under unpleasant conditions to get from one point to another. FYI: If I ever go back to the country, which I really hope since there is so much to see, I will definitely plan in more time than only a month. As soon as you do not take the easy way by airplane, but the normal average way like bus, boat, ferry than there will be always something going wrong. That’s guaranteed! Besides all the troubles, I finally made my way to the rice terraces. All of the passengers were really exhausted. The bus ride was ok. It only took us another 8 hours. Everyone tried to sleep as much as possible, which was not that easy. They air conditioner was set so slow that you were actually freezing in the bus. I could not believe it! Outside of the bus everyone would sweat, but inside of the bus you have goosebumps. Lucky me, I had a sweater with me and a scarf that I could use as a blanket. Most of the passengers were foreign tourists. There were only a few local people with us. When we finally arrived in Banaue, everyone was just tired. We got there; it was raining and cold outside. I was still half-asleep when they put most of the passengers in a jeepney and brought us to the bus companies’ ‘office’ where we could receive further information about where to stay and where to go. All the sudden we were in the middle of a guesthouse and restaurant. It was not an office at all. They tricked us. At least ten different guides were taking care of all the arrivals. I have to admit: That was quite a move! They took advantage of us when we were hungry, cold, tired and exhausted. Almost all of us decided to stay there and go on a tour with them. Respect! That is how it is done! Anyhow. I was too overwhelmed. It was 7am and they just would not let go of you. Even after I already confirmed the room, just took a shower and wanted nothing more than to enjoy my breakfast, they would come again and offer you some crazy expensive tours. At the end, I told them I just want to relax and if I want to do a tour, I will let them know. In my opinion, they tried a little too hard. After resting and re-energizing for a bit, we went for a first walk to the rice terraces in Banaue. They were gorgeous! The mountains and hundreds of hundreds of rice terraces surrounding us were just a completely different side of the Philippines. After all the island hopping and beach lifestyle, this was quite a change in scenery! Even the weather was different up in the Ifugao region. It was not humid and hot anymore. The opposite. It was quite pleasant to walk around in long pants and a sweater. The next day I went to the Batad rice terraces close by. Unfortunately, they just harvested all the rice a couple of days before. The rice terraces were all empty, filled with water, not any less pretty though. Looking over thousands of years old, mainly hand-made terraces was breathtaking! Hiking in-between the terraces was exhausting, but wonderful. After all the water activities, it was fun walking around for hours for a change. On our hike, we were walking thousands of thousands of steps. Uphill, downhill. Nothing but steps. That was the best workout I had in quite a while! At the end, we went thousands of steps down to the 40m high waterfall Tappiya. Listening to the sound of falling water was very relaxing and soothing. During our rest at the waterfall, I was asking our tour guide how the typhoon two weeks ago affected the area. Many Filipinos were wondering about it when I told them that I was going to the rice terraces. ‘We were lucky.’, he laughed. ‘Most of the people already harvested all the rice. So they did not lose much. Only the people who waited too long lost their rice.’ Furthermore, he was telling that the main problem of typhoons passing by is not the wind. The worst is actually the rain that comes with every typhoon. All the houses are built on the hillside. Some on more stable, most on less stable ground. It often comes to many landslides were whole buildings are falling apart; some people might even get buried alive. On our way back to Banaue, the tour guide and I were sitting on top of the jeepney’s roof. That was the local way of transportation. If the jeepney was full of passengers, there was still plenty of room on top of it. Definitely one of my craziest and most dangerous experiences of my life! Although the driver knew we were sitting on the roof, he was speeding up anyway. I had serious troubles to keep me on the roof while he was taking the curves like driving a race. At least I could enjoy the stunning view, but also see some of the left marks of the typhoon. Many palm trees were laying on the street; huge landslides were still visible. No wonder people would sell souvenirs with the saying ‘I survived Banaue’. Now I understood why. Craziest thing in my life! Me riding on the roof of a jeepney!!! At least I felt well prepared for my trip in Southeast Asia even though many people told me I started with the best and easiest country to travel. We will see! Next stop: Singapore! In the Philippines people do not like, they love to eat pork, pork, pork, other meat and fish, of course. They do not really know the concept of a vegetarian diet and consider chicken and fish not as meat, which makes it quite hard to find something actually vegetarian. At least it is easy to communicate and explain the situation since most of the Filipino are fluent in English. When you ask for something without any meat or fish, some Filipino might refuse to prepare something; some others might be more cooperative. That is why it sometimes might take a while to find something to eat; but more importantly, at the end you will find something for sure. When they prepare some food extra for you, you can be at least be sure it is super fresh. So far, all the dishes they made me were delicious! Most of the times it is a combination of rice and vegetables or noodles and vegetables. Every now and then, you can even find tofu. Yummy! Furthermore, the Philippines is getting more and more used to internationals and plenty of tourism. If you cannot find anything at all, just visit one of the many international restaurants that offer Italian, Chinese or Korean food. There you will definitely find a proper vegetarian dish! Anyhow, the Filipino also have a famous specialty that is nothing but disgusting and abnormal in the eyes of a true vegetarian… The dish is called ‘Balut’, fertilized duck or chicken eggs. When you peel the egg and take a bite, you will see the embryo of an unborn duck or chicken. While I was watching other travelers trying this dish, I almost threw up. This is definitely one of the most disgusting things I have ever seen in my life (even after my month traveling in China)! If this is not enough to spoil your appetite. Some traditional Filipinos still eat dog and monkeys. That is also the reason why in some ‘monkey regions’ you can hardly find any monkeys anymore. The hunting scared them off. Besides these very weird national specialties, there are still some eatable dishes for a vegetarian. For example, rice balls with cheese. It sounds like a good and solid dish, but it is not. The opposite. Even though it is made with cheese, it tastes very sweet. People told me it was traditional food. No surprise it was served on almost every daytrip I did on an island hopping boat. I liked it a lot! Like in almost every other country I have visited so far, it is almost impossible to find eatable bread. Although the Philippines have many bakeries, pretty much on every street corner, their products have nothing to do with bread at all. The only goods you can find there are (surprise! surprise!) sweet. Even the so called ‘cheese bread’ is sweet. If you are the sweet breakfast type of person, you will be more than happy in the Philippines. Especially since the products are super cheap! One piece is about 5 pesos, something like 10 cents. Perfect to try yourself through the varieties of all different kind of sweet products! My favorite one: Banana cake. Mmmmhhh! Delicious! Talking about Banana. In the Philippines, you can add Banana ketchup to your dish. No kidding! It tastes pretty much the same like regular ketchup, but it is made out of Banana. Maybe it even has less sugar in it?? Since the Philippines is a fairly hot country, they need to cool down every now and then. How can you do that best? 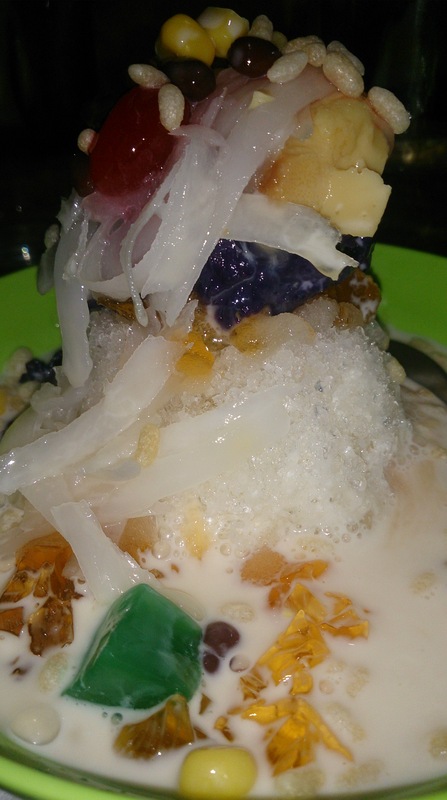 For example, by eating a ‘Halo-Halo’. It is a mix of crushed ice swimming in cold milk combined with fruits and ice cream. Every Halo-Halo might be different. Some add fresh fruit, others dried fruit, most of the times corn and little black beans (the kind of fruit I had not heard of yet…). So much to my food experience. Let’s talk about drinks! Let’s start with the healthy one. Fresh coconut milk! No matter where you are or go, you will always find someone who is celling huge green young coconuts for a couple of pesos. Let them open it up, put a straw inside, enjoy one liter of coconut milk (especially after a night out highly recommendable – think about your electrolytes! ), let them open up the open coconut and enjoy its pulp.